CPCM is managed and run by Nader Majd. 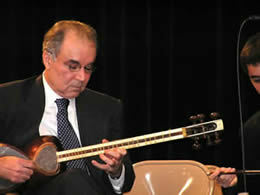 Born in Iran in 1944, Nader is an Iranian musician and scholar. He has been studying and performing music since his childhood. He learned music, both theory and practice, from his father and uncles who were dedicated musicians. Nader specializes in playing and teaching the Tar, Setar, Santur, Violin, and Vocal. He has participated in many concerts and TV shows in Iran and abroad, produced a number of audio and video tapes, and taught music in the USA for the past ten years.